Java language service integration in Visual Studio for Android projects. Importer for Android projects from Eclipse. Requires the Visual C++ Cross-Platform Mobile Development extension and a 32-bit JDK. Visual Studio 2015 or Visual Studio 2017, and a 32-bit JDK are required. Before installing this extension, make sure that you have installed at least the Android components of the Visual C++ for Cross Platform Development features. Get syntax and semantic colorization, semantic highlighting, error and warning squiggles as well as auto-complete, parameter help, quick info tooltips and support for Go-to-definition for all Java sources in your Android project. 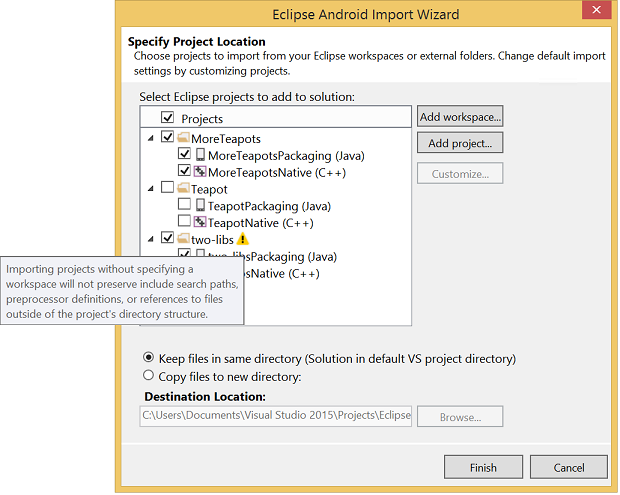 Take advantage of the Visual Studio 2015’s Android development feature for your existing Android projects without the hassle of manually migrating them to Visual Studio by using the Eclipse Android Project Import extension. You will be able to import projects by specifying an Eclipse workspace and choosing the desired Android projects or import individual projects from disk. For more information, check out the blog and the demo video. References between projects and custom build steps are currently not being preserved during the conversion process.